NOTE 2: ( ) = numbers in brackets represent GFH's approximate age in years. Last documented attendance of George II at GFH's theater performances. 28 February : Trio Sonatas, Opus 5, are published by John Walsh, the younger. 2 April : Completes composition of the Organ Concerto in F major, "2nd Set" No 1 (HWV 295; including the third movement which later becomes known as The Cuckoo and the Nightingale). 7 April : Israel in Egypt (HWV 54) performed with the addition of four Italian and English airs from earlier works. 24 April : Completes composition of Giove in Argo (HWV A14, a.k.a., Jupiter in Argos). GFH concludes arrangement with John Rich for use of LIF theatre next season. September : Begins to compose the Opus 6 "Grand Concertos". 15 September : Begins to compose A Song for St. Cecilia's Day (HWV 76) -- after Dryden's ode. 24 September : Completes composition of A Song for St. Cecilia's Day (HWV 76). 29 September : Completes composition of the Concerto Grosso in G major, Op 6 No 1 (HWV 319). 4 October : Completes composition of the Concerto Grosso in F major, Op 6 No 2 (HWV 320). 6 October : Completes composition of the Concerto Grosso in E minor, Op 6 No 3 (HWV 321). 8 October : Completes composition of the Concerto Grosso in A minor, Op 6 No 4 (HWV 322). 10 October : Completes composition of the Concerto Grosso in D major, Op 6 No 5 (HWV 323). 10-11 October (?) : Completes composition of the Concerto Grosso in F major, Op 6 No 9 (HWV 327). 12 October : Completes composition of the Concerto Grosso in B flat major, Op 6 No 7 (HWV 325). 15 October : Completes composition of the Concerto Grosso in G minor, Op 6 No 6 (HWV 324). 17 October : Royal Charter for Foundling Hospital ("The Hospital for the Maintenance and Education of Exposed and Deserted Young Children"; present day "Thomas Coram Foundation") as envisioned by Thomas Coram, a sea captain. 18 October : Completes composition of the Concerto Grosso in C minor, Op 6 No 8 (HWV 326). 19 October : The "War of Jenkins' Ear" (1739-41) begins. This was a conflict between England and Spain. It grew out of a commercial rivalry between the two powers and led to the larger "War of the Austrian Succession". (See below.) The incident that gave the name to the war occurred in 1731 when, according to Robert Jenkins, master of the ship Rebecca, Spanish coast guards cut off his ear. English smuggling and resentment at exclusion from the Spanish colonial trade were the true origins of the war, but Jenkins's story in the House of Commons (1738), reinforced by the showing of his carefully preserved ear, had a tremendous propaganda effect and forced the reluctant Robert Walpole to declare war. Hostilities were limited to sea skirmishes. 20 October : Completes composition of the Concerto Grosso in B minor, Op 6 No 12 (HWV 330). 22 October : Completes composition of the Concerto Grosso in D minor, Op 6 No 10 (HWV 328). 29 October : Advertises subscription for publication of concertos. 30 October : Completes composition of the Concerto Grosso in A major, Op 6 No 11 (HWV 329). 31 October : Granted second copyright privilege for 14 years. This is the first time Acis and Galatea (HWV 49b) is divided into two acts. Performance includes two of the new "Grand Concertos" (Opus 6) . 2 February : Completes composition of Part II of L'Allegro, il Penseroso, ed il Moderato (HWV 55). 4 February : Completes composition of Part III of L'Allegro, il Penseroso, ed il Moderato (HWV 55). 6 February : Performance of Acis and Galatea (HWV 49b) is postponed due to severe frost in London. 17 February : Completes composition of the Organ Concerto in B flat major, Op 7 No 1 (HWV 306). 21 April : Concerti Grossi, Op 6 Nos 1-12 ("Twelve Grande Concertos in 7 Parts"; HWV 319-30) are published by John Walsh, the younger. Early July : Travels to the Continent. "Man sagt, dass vorbemeldeter Hr. Hendel sich nach Berlin zu begeben entschlossen sey." Resumes work on Imeneo (HWV 41). 10 October : Completes composition of Imeneo (HWV 41). 20 October : The last Habsburg Emperor, Charles VI, dies. Before his death, many of the great powers of Europe, including Great Britain, France, Prussia, Russia, and the Netherlands, had guaranteed that Charles's daughter Maria Theresa would succeed him. However, three other claimants appeared upon Charles VI's death. They were: Charles Albert, elector of Bavaria (later, Charles VII, Holy Roman emperor); Augustus III, elector of Saxony and king of Poland; and the Bourbon King Philip V of Spain. Philip V claimed the Habsburg lands because the Habsburg Holy Roman emperor Charles V had been king of Spain from 1516 to 1556. Great Britain declares war on Spain beginning the "War of the Austrian Succession" (-1748). The war is fought by an alliance of Bavaria, France, Spain, Sardinia, Prussia, and Saxony against Austria, the Netherlands, and Great Britain. The North American conflict is referred to as "King George's War." 27 October : Begins to compose Deidamia (HWV 42). 7 November : Completes composition of Acts I and II of Deidamia (HWV 42). "Second Set" of organ concertos (HWV 295-300) are published as transcriptions for the solo keyboard. 14 November : Begins to compose Act III of Deidamia (HWV 42). 20 November : Completes composition of Deidamia (HWV 42). 16 December : Prussia invades Habsburg-ruled Silesia. This represents the last documented performance of a Handel opera under the composer's direction. 4 April : A letter in the "London Daily Post" quotes a rumor that GFH plans to leave England and appeals for support of Handel. GFH's last season at LIF closes. 1 July : The duet Quel fior che all'alba ride (HWV 192) is completed. 3 July : The duet Nò, di voi non vo' fidarmi (HWV 189) is completed. "Handel says he will do nothing next Winter, but I hope I shall persuade him to set another Scripture Collection I have made for him, & perform it for his own Benefit in Passion week. I hope he will lay out his whole Genius & Skill upon it, that the Composition may excell all his former Compositions, as the Subject excells every other Subject. The Subject is Messiah." Early August (?) : Invited by the Duke of Devonshire, William Cavendish, Lord Lieutenant of Ireland, to visit Dublin for the winter season. 22 August : Begins to compose draft of Messiah (HWV 56). 28 August : Completes draft of Part I of Messiah (HWV 56). 6 September : Completes draft Part II of Messiah (HWV 56). "I did think I did see all Heaven before me, and the great God Himself seated on His throne, with his Company of Angels." 12 September : Completes draft of Part III of Messiah (HWV 56). 14 September : Completes filling out of Messiah (HWV 56). 29 September : Begins to compose draft of Samson (HWV 57). 2 October : "Mr Neale's Great Musick Hall in Fishamble Street" [NMH] opens in Dublin. 29 October : Completes draft of Samson (HWV 57). Early November : Leaves London for Dublin; delayed for a few days at Chester, where the young Charles Burney (15) sees him. "I heard with great pleasure at my arrival in Town, that Handel had set the Oratorio of Messiah; but it was some mortification for me to hear that instead of performing it here he was gone into Ireland with it. However I hope we shall hear it when he comes back." 18 November : Arrives in Dublin. He takes lodging in Abbey Street. "It was with great Pleasure I saw the Continuation of Your Kindness by the Lines You was pleased to send me, in Order to be prefix'd to Your Oratorio Messiah which I set to Musick before I left England." 28 January : Swift, Dean of St. Patrick's Cathedral, Dublin, objects to cathedral singers taking part in performances. 11 February : Robert Walpole resigns from Parliament. "For the Relief of the Prisoners in the several Gaols, and for the Support of Mercer's Hospital in Stephen's Street and of the Charitable Infirmary on the Inns Quay, on Monday the 12th of April [recte April 13], will be performed at the Musick Hall in Fishamble Street, Mr. Handel's new Grand Oratorio, call'd the MESSIAH, in which the Gentlemen of the Choirs of both Cathedrals will assist, with some Concertoes on the Organ, by Mr Handell." "The Stewards of the Charitable Music Society request the Favour of the Ladies not to come with Hoops this Day to the Musick-Hall in Fishamble Street : The Gentlemen are desired to come without their Swords." 13 August : Departs Dublin for Chester, England. by 9 September : Returns to London. 31 October : Completes composition of the duet Beato in ver chi può (HWV 181). 2 November : Completes composition of the duet Nò, di voi non vo' fidarmi (HWV 190). 29 November : Anglo-Prussian alliance is secured. "His Messiah has disappointed me, being set in great hast, tho' he said he would be a year about it, & make it the best of all his Compositions. I shall put no more Sacred Works into his hands, to be thus abus'd." 5 February : Completes composition of the Organ Concerto in A major, Op 7 No 2 (HWV 307). A Lenten subscription series of oratorio concerts begins. "As to the Messiah, 'tis still in his power by retouching the weak parts to make it fit for a publick performance; & I have said a great deal to him on the Subject; but he is so lazy and so obstinate, the I much doubt the Effect." "Handel has set up an Oratorio against the Operas, and succeeds. He has hired all the goddesses from farces and singers of Roast Beef from between the acts at both theatres, with a man with one note in his voice, and a girl without even an one; and so they sing, and make brave hallelujahs; and the good company encore the recitative, if it happens to have any cadence like what they call a tune." London premiere of "A New Sacred Oratorio" is announced; Messiah (HWV 56) is not mentioned by name. A correspondent for The Universal Spectator condemns the practice of performing oratorios, set to sacred words, for "diversion and amusement" in playhouses, sung by "a Set of People very unfit to perform so solemn a Service", citing the upcoming performance of Messiah as a prime example of profanity. 11 April : Report circulates that "Mr. Handel, who has been dangerously ill, is now recover'd." "Handel has a return of his Paralytic Disorder, which affects his Head & Speech." "We are likely at last to have no Opera next year: Handel has a palsy, and can't compose." 27 June : British, Hanoverian, and Hessian soldiers ("The Pragmantic Army"), under the joint command of George II, are victorious over the French at Dettingen am Main in Bavaria. circa July : Lord Middlesex asks GFH to compose operas for his company. He initially accepts but later declines the invitation. 17 July : Begins to compose the Dettingen Te Deum (HWV 283). circa 29 July : Completes composition of the Dettingen Te Deum (HWV 283). 30 July : Begins to compose the Dettingen Anthem (HWV 265). 3 August : Completes composition of the Dettingen Anthem (HWV 265). 24 August - 19 November : Acis and Galatea (HWV 49b) score is published in 10 sections. 26 August : Begins to compose Joseph and his Brethren (HWV 59). 12 September : Completes composition of Joseph and his Brethren (HWV 59). 13 September : Treaty of Worms (Austria, Great Britain, Sardinia) is signed. The King of Sardinia is promised Piacenza and a part of Lombardy. "I don't yet despair of making him retouch the Messiah, at least he shall suffer for his negligence; nay I am inform'd that he has suffer'd, for he told Ld Guernsey, that a letter I wrote him about it contributed to the bringing of his last illness upon him; & it is reported that being a little delirious with a Fever, he said he should be damn'd for preferring Dagon (a Gentlemen he was very complaisant to in the Oratorio of Samson) before the Messiah. This shews that I gall'd him: but I have not done with him yet." 25 October : French/Spanish alliance at Fontainebleau. George II returns to London. "Semele has a strong party against it, the fine ladies, petit maîtres, and ignoramus's. All the opera people are enrag'd at Handel." 15 March : France declares war on Britain. The French army, let by Marshal de Saxe, invades the Low Countries. 27 April : James Miller, librettist of Joseph and his Brethren (HWV 59), dies. Approaches Jennens for a new libretto. "Handel has promis'd to revise the Oratorio of Messiah, & He & I are very good Friends again. The reason is he has lately lost his Poet Miller, & wants to set me at work for him again." 5 June : France/Prussia alliance. by 9 June : Secures KT for the next concert season. 18 June : The "Middlesex" opera company (named after Lord Middlesex) closes its concert season at KT. June (?) : Departs London, presumably to stay in the country with a patron. 18 July : Returns to London. Begins to compose Hercules (HWV 60). Receives from Charles Jennens the text for Act I of Belshazzar (HWV 61). "Be pleased to point out these passages in t[h]e Messiah which You think require altering." 17 August : Completes Hercules (HWV 60). 23 August : Begins to compose Belshazzar (HWV 61). 20 October : Announces subscription series of 24 concerts "every Saturday till Lent, and then on Wednesdays and Fridays." 23 October : Completes Belshazzar (HWV 61). 24 November : Second performance postponed because subscribers are "not in Town". Gluck arrives in London at the invitation of the King's Theatre. January : The Quadruple Alliance is formed (Austria, Saxony, Britain, Holland) against France, Bavaria, and Prussia. 17 January : In a letter to the "Daily Advertiser", GFH announces that his attempts to please the public are ineffectual, and he proposes to return three-fourths of the money subscribed. 18 January : A letter of support is published urging subscribers not to withdraw the remainder of their subscriptions. 21 January : An anonymous poem is published supporting Handel and blaming his woes on the intrigues of the society ladies (possibly written by Lady Brown, wife of the former British Resident in Venice). 25 January : Because of the strong public support he receives, GFH announces resumption of concerts. Travels to Exton in Rutland, Leicester, the seat of the Early of Gainsborough, "for Quiet and Retirement." 16 May : Prince Charles Edward Stuart (also referred to as "The Young Pretender" or "Bonnie Prince Charlie") issues a manifesto requiring that his father's ("Jacobite James III") subjects "forthwith repair to His Majesty's royal standard." circa 13 June : Leaves Exton for the spas of Scarborough, North Yorkshire. 21 July : The Young Pretender lands at Ericsay, Scotland, (the Outer Hebrides); this begins the second Jacobite rebellion. "I shall show you a collection I gave Handel, call'd Messiah, which I value highly, & he has made a fine Entertainment of it, tho' not near so good as he might & ought to have done. I have with great difficulty made him correct some of the grossest faults in the composition, but he retain'd his Overture obstinately, in which there are some passages far unworthy of Handel, but much more unworthy of the Messiah." 31 August : Completes composition of the duet Ahi, nelle sorti umane (HWV 179). 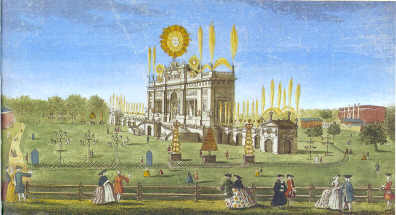 17 September : The Young Pretender enters Edinburgh, Scotland. "Poor Handel looks something better. I hope he will entirely recover in due time, though he has been a good deal disordered in his head." 28 October : The Duke of Cumberland returns to England (from the Continent) to defend the nation against the Young Pretender. 8 November : Jacobite forces enter England. 17 November : The Young Pretender takes Carlisle. 4 December : The Young Pretender advances to Derby (125 miles from London). 20 December : Finding no popular support among the English, The Young Pretender returns to Scotland. 31 December : The Duke of Cumberland regains Carlisle. January - February : Composes The Occasional Oratorio (HWV 62). 26 May : From scourging rebellion (HWV 228.9) is published. 8 or 9 July : Begins to compose Judas Maccabaeus (HWV 63), "as a compliment to the Duke of Cumberland, upon his returning victorious from Scotland." 22 July : Completes composition of Act I of Judas Maccabaeus (HWV 63). 11 August : Completes the remaining composition of Judas Maccabaeus (HWV 63). 20 September : After wandering the Highlands of Scotland for 6 months, The Young Pretender escapes to France. 16 March : Lord Lovat, a Jacobite, is brought to trial, causing the postponement of some concerts. 8 April : Judas Maccabaeus (HWV 63) is announced with "additions" -- probably the air O liberty and the March. 1 June : Begins to compose Alexander Balus (HWV 65). 4 July : Completes composition of Alexander Balus (HWV 65). 19 July : Begins to compose Joshua (HWV 64). 19 August : Completes composition of Joshua (HWV 64). Thomas Lowe replaces John Beard as GFH's principal tenor. 30 April : Preliminary Peace of Aix-la-Chapelle (Aachen). 5 May : Begins to compose Solomon (HWV 67). 13 June : Completes compostion of Solomon (HWV 67). 11 July : Begins to compose Susanna (HWV 66). 24 August : Completes composition of Susanna (HWV 66). 18 October : The Treaty (or Peace) of Aix-la-Chapelle (Aachen) is signed concluding the "War of the Austrian Succession" (1740-). The treaty is signed between George II, the Empress Maria Theresa, Louis XV of France, Charles Emanuel III of Sardinia, Ferdinand VI of Spain, Francis III of Modena, the United Provinces of the Low Countries, and the Republic of Genoa. It restores Louisbourg (in Canada) to France, gave Madras (in India) to the British, accorded Silesia from Austria to Prussia, and confirmed the succession of Maria Theresa to the Austrian throne. In addition, Austria ceded the duchies of Parma and Piacenza and other of its Italian holdings (Gustalla) to Philip V of Spain. The treaty also confirms the succession of the House of Hanover to the thrones of England, Scotland, and Ireland. France evacuates the Austrian Netherlands. 2 February : Peace is proclaimed in London. London début performance of Giulia Frasi (soprano). End of March (?) : Completes composition of the Music for the Royal Fireworks (HWV 351) in celebration of the peace of Aix-la-Chapelle; This is GFH's last ceremonial commission for the House of Hanover. "I think Hendel now proposes to have but 12 trumpets and 12 French horns; at first there was to have been sixteen of each, and I remember I told the King so, who, at that time, objected to their being any musick; but, when I told him the quantity and nomber of martial musick there was to be, he was better satisfied, and said he hoped there would be no fidles. Now Hendel proposes to lessen the nomber of trumpets &c. and to have violeens. I don't at all doubt but when the King hears it he will be very much displeased..."
By 9 April : GFH compromises on the scoring: 9 trumpets, 9 horns, 24 oboes, 12 bassoons, a contra-bassoon (later deleted), and 3 kettle-drums, with strings indicated to double the oboes and bassoons. 22 April : The Peace Anthem (HWV 266) and "Queen Caroline" Te Deum (HWV 280) are rehearsed. 4 May : GFH attends the General Committee of the Foundling Hospital and offers a performance to benefit the charity at the newly built Chapel. Foundling Hospital Anthem (HWV 268) premieres. Other compositions include Music for the Royal Fireworks (HWV 351; including parts for strings), Dettingen Anthem (HWV 265), and selections from Solomon (HWV 67). 28 June : Begins to compose Theodora (HWV 68). 31 July : Completes composition of Theodora (HWV 68). By 19 August : Travels to Bath. 5 September : Heidegger (83) dies. by 30 September : Returns to London. 27 December : Begins to compose music for Tobias Smollet's play Alceste (HWV 45). 8 January : Completes the music for Alceste (HWV 45) -- but two airs probably recomposed at a later time. The planned performances of Alceste (HWV 45) are cancelled. 31 January : Completes the Organ Concerto in G minor, Op 7 No 5 (HWV 310). "seen Handel several times...and think I never saw him so cool and well. He is quite easy in his behaviour, and has been pleasing himself in the purchase of several fine pictures, particularly a large Rembrandt, which is indeed excellent..."
The Rembrandt cost him about £8000. 1 April : On or before this date, the oculist ("ophthalmiater") John Taylor (1703-1772) operates on J.S. Bach's eyes. 4-8 April : John Taylor operates for a second time on J.S. Bach's eyes. 9 May : Elected a Governor of the Foundling Hospital. Because of overcrowding during the May 1 performance, Messiah (HWV 56) is performed a second time for the benefit of the Foundling Hospital charity. 1 June : Makes out his Will -- including a large bequest to John Chistopher Smith (the elder) of "my large Harpsichord, my little House Organ, my Musick Books, and five hundred Pounds sterl"; his niece Johanna Floerken is the residual legatee. 28 June : Begins to compose The Choice of Hercules (HWV 69). 5 July : Completes composition of The Choice of Hercules (HWV 69). circa 11 August : Travels to Germany for the last time. 21 August : The General Advertiser reports that GFH was hurt in a coach accident between The Hague and Haarlem, but that he "is now out of Danger." 27 August (New Style) : Visits Haarlem. by 14 December : Returns to London. 14 December : Writes to his old friend, Georg Telemann, commenting on the singer Passerini and thanking him for the copy of Das neue musikalische System; GFH tells Telemann in the letter that he is sending him a gift crate of rare plants -- Telemann is an amateur botanist. 1 January : Begins to compose the Organ Concerto in B flat major, Op 7 No 3 (HWV 308). 4 January : Completes composition of the Organ Concerto in B flat major, Op 7 No 3 (HWV 308); this is his final instrumental work. 21 January : Begins to draft Act I of Jephtha (HWV 70). 2 February : Completes the draft for Act I of Jephtha (HWV 70).
? February : Begins to draft Act II of Jephtha (HWV 70). 13 February : While composing the chorus, How dark, O Lord, are thy decrees in Act II of Jephtha (HWV 70), GFH is unable to continue because of "relaxation" of his left eye. 23 February : Resumes work drafting Act II of Jephtha (HWV 70) feeling "etwas besser". 27 February : Completes the draft of Act II of Jephtha (HWV 70). "Noble Handel hath lost an eye, but I have the Rapture to say that St Cecilia makes no complaint of any defect in his Fingers". Frederick, Prince of Wales, dies; the remainder of the oratorio season is cancelled. The bass Henry Theodore Reinhold dies. May : Act passed for adoption of the reformed (Gregorian) calendar throughout England and its colonies. The year will begin on 1 January instead of 25 March. 3 June : Arrives in Bath. John Christopher Smith, the younger (1712-95), returns from France to assist with the management of the oratorio seasons. 18 June : Begins to draft Act III of Jephtha (HWV 70). "15 or 17 July" : Completes the draft of Act III of Jephtha (HWV 70). Late July : Foundling Hospital general committee considers arrangements for opening the chapel. 30 August : Completes composition of Jephtha (HWV 70). "Handel you know has composed Jephtha, and I am sorry to say that I believe this Lent will be the last that he will ever be able to preside at an oratorio; for he breaks very much & is I think quite blind in one eye." 26 March : The oratorio concert series closes with a revival of Messiah (HWV 56). 20 July : Johann Christoph Pepusch (circa 85) dies. "seiz'd a few days ago with a Paralytick Disorder in his Head which has deprived him of Sight". 3 November : Undergoes eye operation ("couching" -- a procedure to treat cataracts) by William Bromfield, Surgeon to the Princess of Wales, to restore his sight. The operation is a short-term success. 23 January : Reportedly well enough to go out of doors. 27 January : A London newspaper reports that GFH has "quite lost his Sight". "it was such a melancholy pleasure, as drew tears of sorrow, to see the great though unhappy Handel, dejected, wan and dark, sitting by, not playing on the harpsichord, and to think how his light had been spent by being overplied in music's cause. I was sorry to find the audience so insipid and tasteless (I may add unkind) not to give the poor man the comfort of applause; but affectation and conceit cannot discern or attend to merit." 3-5 April : A London newspaper reports a false rumor that GFH is composing an anthem for his own funeral. December : The Musical Society of Edinburgh request copies of the unpublished sections of Messiah (HWV 56) and other oratorios. GFH directs John Christopher Smith (the elder) to provide them. 25 June : The General Committee of the Foundling Hospital notes GFH's approval of the younger John Christopher Smith being appointed the organist of the Foundling Hospital Chapel, and "on Account of his (GFH's) Health he excused himself from giving any further Instructions relating to the Performances." 20 September : Dictates and signs letter to his old friend, Georg Telemann, rejoicing that rumors of Telemann's death are false and promises to send him another shipment of exotic plants. 1 December : Maurice Greene (59) dies. 16 January : Treaty of Westminster (Great Britain/Prussia) is signed. 27 January : Wolfgang Theophilus (later Amadeus) Mozart is born. "It did not take, it is too solemn for common ears." 1 May : Alliance of Versailles (France/Austria). 15 May : Great Britain declares war on France beginning the "Seven Years War" (-1763; by the conclusion of the conflict, France cedes Canada and the Mississippi Valley to Britain. Robert Clive captures India from the French at the Battle of Plassey (1757). 6 August : Adds Thomas Morrell and Newburgh Hamilton to his Will. In addition, he increases John Christopher Smith's (the elder) bequest by £1500. 29 August : Frederick the Great invades Saxony. "is better than he has been for some years and finds he can compose Chorus's as well as other music to his own...satisfaction. His memory is strengthened of late to an astonishing degree." Possibly collaborates with Thomas Morell over the adaption of Il trionfo del Tempo e della Verità (HWV 46b) into The Triumph of Time and Truth (HWV 71). According to Thomas Morrell, the new addition, Sion now her head shall rise, is the last chorus composed by GFH. 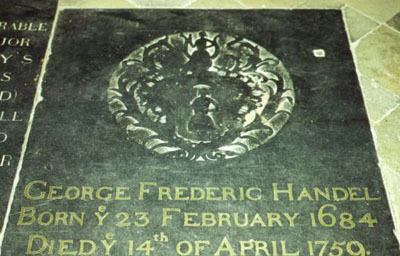 22 March : GFH modifies his Will for the second time. 23 July : Domenico Scarlatti (71) dies. 4 August : GFH modifies his Will for the third time, bequeathing his theater organ at CG to John Rich, paintings to Jennens and Bernard Granville, and a "fair copy of the Score and all Parts" of Messiah (HWV 56) to the Foundling Hospital. "pretty well and has just finished the composing of several new songs for his new singer" (referring to Cassandra Frederick). 11 April : Second Treaty of Westminster: Prussia and Britain pledge not to make a seperate peace. August : Travels to Tunbridge Wells (possibly with Thomas Morell) where he is treated unsuccessfully -- by the oculist John Taylor. 7 April : GFH intends to travel to Bath but is too ill to do so. 11 April : Modifies his Will for the fourth time, bequeathing £1000 to the Society for the Support of Decayed Musicians and desiring burial in Westminster Abbey and for a monument of him to be erected there. He bequeaths £600 for the monument. "I hope to have the permission of the Dean and Chapter of Westminster to be buried in Westminster Abbey in a private manner at the discretion of my Executor, Mr. Amyand, and I desire that my Executor, may have leave to erect a monument for me there." "He took leave of all his friends on Friday morning, and desired to see nobody but the Doctor and Apothecary and myself. At 7 o'clock in the evening he took leave of me, and told me we "should meet again"; as soon as I was gone he told his servant 'not to let me come to him any more, for that he had now done with this world'. He died as he lived -- a good Christian, with true sense of his duty to God and man, and in perfect charity with all the world." 14 April; approx. 8 am : Dies at his home on Brook Street. "It is computed there were no fewer than 3000 Persons present on this Occasion." 24 May : A memorial concert of GFH's sacred music is given under the direction of the younger Smith: The Foundling Hospital Anthem (HWV 268) and the Coronation Anthems (HWV 258-61). 27 August : By order of his GFH's executors, the contents of his house are sold to his servant John Duburk. 10 October : One of the executors, George Amyand, pays the residue of the estate to GFH's niece, Johanna Floerken.